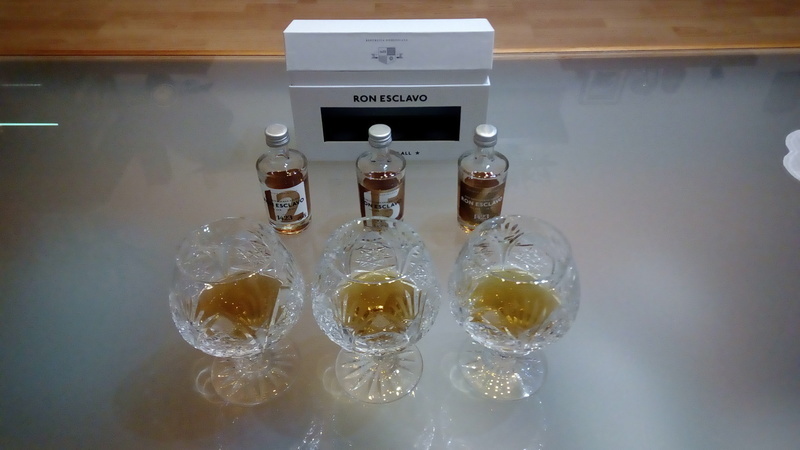 Have you found an online vendor selling Ron Esclavo 12-Year? Tasted in Copenhagen. Sweet almost rubbing alcohol nose. First taste hits after s second with a spicy bang, and lingers literally forever - minutes. Just too much spice for me, difficult to taste much else. Shot of water opens it up with a much more molasses taste and oily finish. I like it, lovely sweet taste, not as good as the XO but closes. Need to try the 15 YO just to compare them all. Duft: lækker sød duft. vanilie, røget, blomme, kandis og en lille smule sprit. God rom uden at friste til et extra glas. Duft : Sød frugt. Lidt sukker. Smag : Blomme og søde frugter. 20ml uit een advent kalender. Typische Spaanse stijl rum. Karamel, beetje hout en veel suiker gok ik zo. Voor de mensen die van "smooth" houden. Sometimes I don't mind a real sugar bomb - they are easy to drink. But the sugar takes away the individuality and complexity that the rum might have. The nose is very sweet vanilla, typical of many a rum that has a lot of sugar added. Its the palate that is more interesting. There is a softness to it, with a hint of alcohol that counteracts the sweetness a little. Medium bodied with a hint of spice, it is an easy rum if a little unsophisticated. Far too short on the finish. Fine when you are in the mood for a sweet rum, but not an everyday one. Overall a bit disappointing. Let me be blunt. This rum is nothing special, but it is a nice gateway to better rums for someone, who is new to exploring this wonderful world of rum. Taste: Dominating taste of vanilla and caramel. Pleasant without being complex in any way. Overall: As said above. This is a nice rum for beginners, which also can be enjoyed by more experienced rum-drinkers. Au goût, des notes de sirop d'érable sont présentes. J'ai eu l'impression de boire du dictator 12 ans. Schneller abgang und ziemlich bitter ! Klares helles Bernstein im Glas. In der Nase, frische tropische Früchte auf getoastetem Holz und mit heisser Schokolade übergossen. Im Gaumen sanft und geschmeidig, süss und lecker wie Schokoladen-Milch mit Karamell und Zimt. Im Abgang etwas scharf mit süsser Schokolade, Karamell und Früchten. Ein süsser Dom. Rep. Solera Rum für Einsteiger, Geniesser und einfach Alle. Clear bright amber in the glass. On the nose, fresh tropical fruit on toasted wood and doused with hot chocolate. Soft and smooth on the palate, sweet and delicious as chocolate milk with caramel and cinnamon. On the finish a bit spicy with sweet chocolate, caramel and fruits. A swet Dom. Rep. Solera Rum for beginners, connoisseurs and everyone. Classical nose, bit sweetish with vanilla, citrus, same on palate woth warm, medium lenght finish. Very correct. Palate: spicy, but poor body. Did expect more after the aromatic scent in the nose. Svag doft, smakar lite smörkola. XO är mycket bättre, man känner att de har samma karaktär. God vaniljig doft och smak. Fyllig och god. Något kort eftersmak. En bra rom helt enkelt. In the nose i felt sweet pastry and caramel. Very well balanced rum, round and smooth. On the nose, it is sweet with touches of vanilla and toffee. The colour resembles dark caramel. A fine rum but needs to age a little bit longer. Nose: brown sugar, vanilla. Palate: alcohol, butterscotch, vanilla. You can feel that it's a young rum that could promise much more in taste if it could age longer. But a good rum though! !